Programming is intimidating. Common programming stereotypes involve sitting at a computer looking at lines of dense symbols and code. This perception discourages people, particularly children, from learning programming. Dr. Wagon dispels these impressions and facilitates a new way to learn programming that is interactive and concrete. Dr. 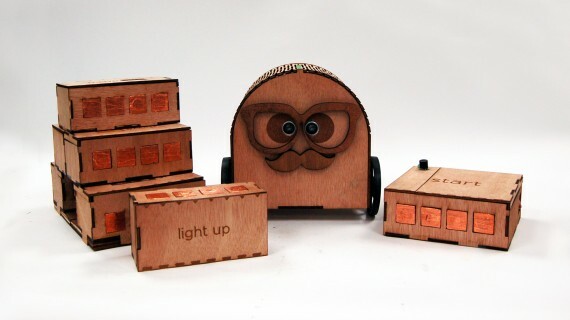 Wagon was designed for children ages 6-12, and is intended to provide children with a playful and more accessible introduction to computer programming. In the initial stages of development, we observed children and their play habits. We spoke with parents to best understand their primary concerns and needs for their children. We also spoke with researchers and product developers with expertise in learning technologies and product development. We also conducted a landscape analysis to understand what products currently exist that engage children in programming (ex. Scratch, TERN, etc.). Through our research, we realized that there were plenty of digital interfaces that teach introductory programming. However, for children who don’t identify as with tech and engineering, it was important to provide a more accessible alternative. We also learned that for this audience, physical interfaces are more appealing than digital interfaces. Furthermore, we considered what would be most appropriate for home-based learning. So we aimed to create a portable, physical toy that would be familiar and comforting and easy to engage with. We tested the product with approximately 30 children and parents. While there were a few concerns regarding the durability of the prototype, the response to the product concept was positive. After seeing a demo of how the product worked, children as young as 7 grasped the concept and would independently explore creating programs with the toy. Parallel form of play: Dr. Wagon is modeled after an existing form of play, wooden blocks. It builds upon an existing understanding of the physical world and creates a more seamless transition into programming. Interaction with environment: Sensors are embedded in the robot, which permit the sense of color and distance. This takes programming out of a computer screen and places it in the real world. Low threshold and high ceiling: Children can create simple programs. Example: “turn 180” – the robot turns 180 degrees. 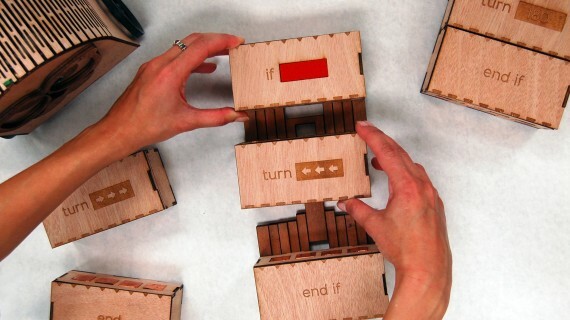 Children can also easily layer on complexity with loops (“repeat”) and conditionals (“if” statements). Example: “if red” + “turn a little” + “repeat forever” – if the robot moves over a patch of red, it will turn in a circle). The immediate success provides an easy entry point, and the complexity will sustain children’s engagement as their learning.